Day 230: It Doesn’t Get Much Wilder Than This . . .
To say that it’s been a ‘Wild Week’ may be the understatement of the century. Seriously, Monday was Patriot’s Day in Boston and the running of the famed Boston Marathon. Through good years and bad, we’ve watched the runners who’ve run this race finish strong, collapsed at the finish line and rejoice in what they’ve accomplished. What an triumph! To run 26.2 miles and endure some of the most grueling hills and terrain, the runners who participated Monday had NO idea of what lay ahead. Today, the FBI released photos of two men, who they say, are people of interest in the case of the Boston Marathon bombing. Could it get any wilder? The week has been like a roller coaster on steroids. . .so many twists, turns and drops that one must wonder what in the world is going on! 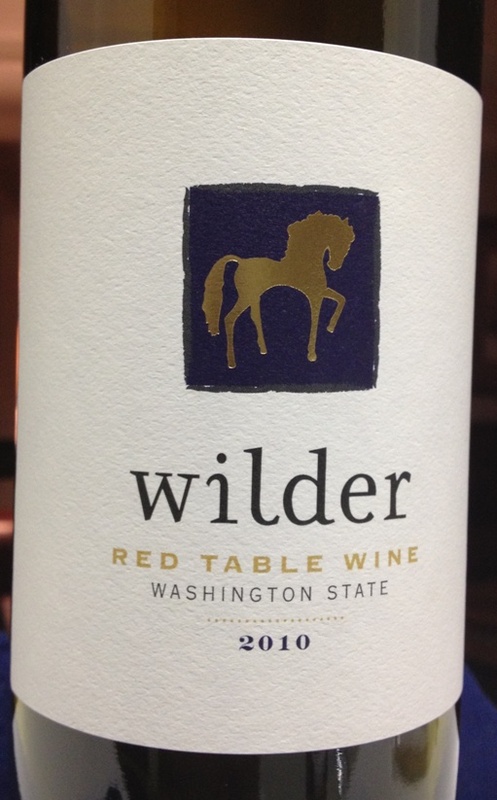 Enter tonight’s wine of choice…a 2010 Wilder Red Table Wine from Washington. Color in the glass is a deep, clear garnet, and the nose is redolent of cassis, plum, boysenberries, and spice. Upon first sip, the Wilder Red is bright, light, and fruity with an elegant acidity that fades gracefully away to a dark, seductive earthiness. The finish just goes for miles, a swirling tornado of mushrooms and graphite, with the daintiest little tannins. We’ve had the opportunity to expand our horizon’s with Washington wine and the truth is, we’re hooked! Now, we can’t wait to get up to the Seattle area and visit with Jean’s sister, Sara and her better half, Sylvia! This stuff is GOOD. A little sweet to be sure, but as it opened up–wow, what a nice wine. We’ve come to LOVE the city of Boston…not just because our daughter goes to school there, but because it’s a town with a ‘Can Do’ attitude. Maybe it’s just a town with an attitude! Seriously, no disrespect here…there are some places that you visit and you get the sense that they–well, they get it! Boston is that kind of town. We watched the National Anthem being sung prior to the Bruins’ game. . .sorry, we’ve NEVER heard so MANY people singing–even dating back to the events after September 11th. These folks clearly get it and NOTHING and we mean NOTHING will stand in their way. We kind of like that–it’s a Texas quality as well. We’ve watched like so many others of the closeness in the town of West. Close doesn’t even begin to describe the way that folks look out for each other. We know that cousins, nephews, nieces, aunts, uncles, brothers, sisters and many others have ALL stepped up to lend a hand while secretly grieving because they’ve lost someone—someone they knew, someone their friends’ or families’ knew. . .but in a town of 2,500–let’s be honest, you know just about everyone! To the first responders in Boston and West, we raise a glass and say, “Thank You”. We don’t do what you do–we don’t always appreciate what you do, BUT we know that with you, we’re better and without you, we’d be lost. First responders–like those who jumped in to help the wounded in Boston–they are an amazing breed of men and women. The First responders in West–ALMOST ALL OF THEM-VOLUNTEERS–what can you say? It’s not just a job–it’s a CALLING! These people-who volunteer–are called to do something that very few people EVER do–help, rescue, care. AMAZING. We enjoyed tonight’s wine; probably because it’s name gave us a sense of purpose in knowing that whether in Texas or Massachusetts, there are still people in our world who care. There are still men and women who are willing to risk everything and put it on the line–for others. To the men and women who are First Responders, we salute you and pray to the Good Lord that you never lose that love. For without YOU–we may become lost! Categories: Uncategorized | Tags: Boston, Boston Marathon, Texas, West | Permalink. Thank you to Jean and Brian for stepping up and working with me to try and help my colleagues traveling to West, TX on Wednesdaqy evening. Right now the Red Cross has over 50 volunteers working this situation. Red Cross volunteers were also active in Boston along the entire race route helping with first aid … and they stepped up in the explosion area. Volunteers are a great example of why our country is so wonderful. First responders put it “on the line” whenever they respond – and they do it simply because they care and it is the right thing to do. The American Red Cross is strong because of our volunteers and those who support our efforts – we cannot make a difference without them. Thank you to Jean & Brian who “volunteered” to help too! Blessings.